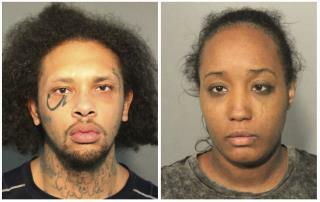 (Newser) – Police say they removed 10 children from a squalid California home and charged their father with torture and their mother with neglect after an investigation revealed a lengthy period of severe physical and emotional abuse. The children range from 4 months to 12 years old, says Fairfield police Lt. Greg Hurlbut. The mother, Ina Rogers, told reporters that she called authorities in March after her 12-year-old son didn't come home. She said the "squalor" officers saw while investigating came from her tearing her house apart as she searched for her child. "I was afraid I could not find him," she told KGO-TV. "Once that fear sets in you don't know what to do." The investigation began March 31 when police responded to the missing juvenile report in Fairfield, 46 miles northeast of San Francisco. The officers found the boy and returned him to the family home, where they said they found nine other children living in "squalor and unsafe conditions." The father, Jonathan Allen, 29, faces felony charges of torture and child abuse and the 30-year-old Rogers faces child neglect charges, the AP reports. She was arrested March 31 and released after posting $10,000 bail. Allen was arrested Friday after specialists conducted interviews with the children, Hurlbut says. He's being held in the Solano County Jail in lieu of $1.5 million bail. Jeez, if you can't trust someone who uses their face as a doodle pad, who can you trust? ..welfare mom...welfare dad....10 welfare checks, I mean, Kids.....section 8 formerly nice home.....Democrats have had a stranglehold on California politics for over 50 years, and they see a family like this as a success story. ...and the idiot voters of California will vote in a new bunch who continue down the same political path with the same retarded policies...and end up with more "success stories" like this one.